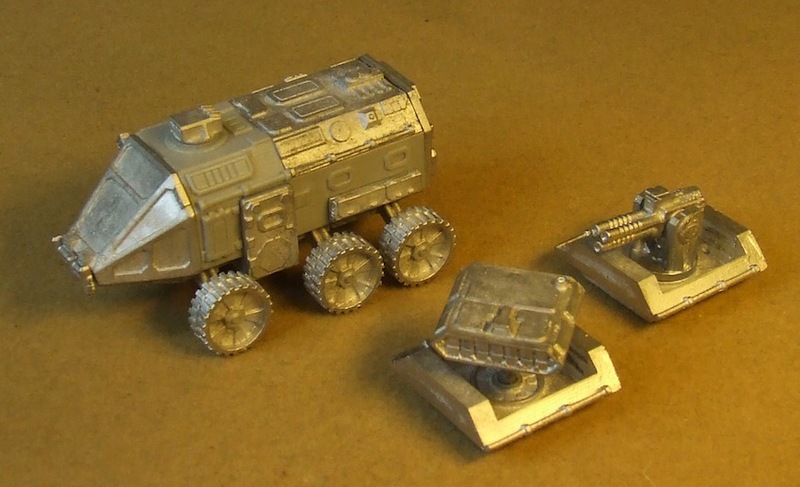 MG15-USV01B US Lunar Force ROVER - six-wheeled pressurised transport, RESIN AND METAL KIT - fire support version with choice of retractable multiple missile pod or triple heavy laser cannon (both weapon options supplied, plus ONE rear hull section and rear panel specific to this model). This is a COMPLETE KIT, containing the same parts as the "A" version of the Rover except for the metal REAR DECK, BACK PANEL and WEAPONS, which are replaced with variant parts for the "B" version. NOTE that the "standard" rear deck piece of the "A" version is NOT included in the "B" kit despite being shown in photos here! The ROVER models are multi-media kits with RESIN CAST main body parts plus metal components; some modelling skills and experience are recommended for assembly of all the kits in this range!